[New York, NY – May 30, 2018] Today, seven-time Grammy Award winning blues icon Buddy Guy releases a brand new song “Blue No More” featuring James Bay. The song is featured on his forthcoming album THE BLUES IS ALIVE AND WELL, set for release June 15th on Silvertone/RCA Records. Today, Billboard Magazine shared a video clip from James Bay speaking excitedly about recording with the legendary blues musician. Just last week, the Americana Music Association announced that Buddy Guy will be the recipient of their Lifetime Achievement Award. Buddy will receive the honor at a September 12th ceremony at Nashville’s Ryman Auditorium. Visit http://americanamusic.org/ for more information. 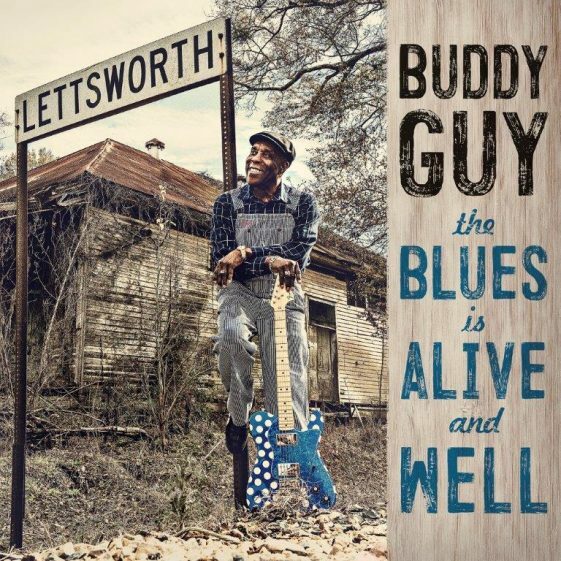 THE BLUES IS ALIVE AND WELL is Buddy Guy’s follow up to his 2015 album Born To Play Guitar, which won “Best Blues Album” at the 2016 Grammy Awards, debuted at #1 on Billboard’s Top Blues Album charts and marked Guy’s fifth #1 album on the chart and twelfth Top 10 Billboard Blues album. THE BLUES IS ALIVE AND WELL features guest appearances by Mick Jagger on “You Did The Crime,” Keith Richards & Jeff Beck on “Cognac,” and James Bay on “Blue No More.” Grammy Award winning producer/songwriter and longtime collaborator Tom Hambridge produced the album. In his quest to keep the genre vital, Guy chats about the origin of southern blues and performs on David Letterman’s Netflix series, My Next Guest Needs No Introduction, which began airing on May 4th. The recipient of the 2015 Grammy Lifetime Achievement Award, Buddy Guy’s incredible career spans over 50 years with just as many albums released. Career highlights include 7 Grammy Awards, 37 Blues Music Awards, Kennedy Center Honors, NARM Chairman’s Award for Sustained Creative Achievement, Billboard Music Awards’ Century Award for distinguished artistic development, Presidential National Medal of Arts, and induction into the Rock and Roll Hall of Fame to name a few. At 81 years young, Guy proves that it gets greater later as he continues to record and tour around the world with recent performances at the New Orleans Jazz & Heritage Festival, Austin City Limits Live at the Moody Theater and more (click here and see below for full touring schedule). Buddy Guy Confirms “The Blues Is Alive And Well” – New Album Out Now!